This comment refers to the article available at https://doi.org/10.1007/s40264-018-0769-5. In response to the recently published article by Ehlken et al. , we present evidence that the analysis is scientifically invalid and consequently the authors’ conclusions are incorrect and misleading. According to the European Medicines Agency (EMA), the overall methodology used by Ehlken et al. is invalid and misleading for the purpose of comparing safety profiles of different drugs . 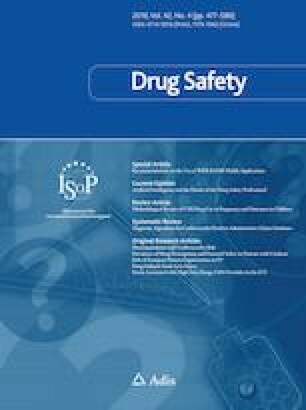 Recently, the Head of Pharmacovigilance and Epidemiology at the EMA stated that, “… to conclude that one product is safer than the other, based on numbers of spontaneous suspected adverse reaction reports alone, without consideration of all other relevant data, including clinical trials and epidemiological studies, is in our view ostensibly simplistic, invalid and misleading” . Therefore, the methodology of Ehlken et al. is fundamentally flawed. Additionally, the analysis by Ehlken et al. suffers from a number of limitations and biases that further invalidate its results and conclusions as explained below. The Ehlken et al. analysis did not compare ferric carboxymaltose (FCM) and iron isomaltoside at similar stages in the lifecyles of the products and therefore failed to consider the well-known fact that reporting rates of spontaneously reported adverse reactions tend to decrease over time. FCM was launched in 2007 and entered the market 3–10 years earlier than iron isomaltoside (earliest launch in 2010). The restricted timeframe (2014–2017) used in the Ehlken et al. analysis ignores the early postmarketing period for FCM and is therefore biased in favour of FCM. Indeed, published data from a pharmacovigilance report for FCM (prepared by the Swiss Medicines Agency, Swissmedic)  in the period between 1 January 2010 and 1 October 2013 correspond to a similar stage in the FCM lifecycle to that used for iron isomaltoside in the Ehlken et al. analysis. These data represent a reporting rate for FCM-associated anaphylactic reactions alone that is similar to the reporting rate for iron isomaltoside for anaphylactic or anaphylactoid reactions combined, as stated by Ehlken et al. (Fig. 1). Another limitation of the Ehlken et al. analysis lies in the restriction of qualifying hypersensitivity reactions to just four preferred terms: ‘anaphylactic reaction’, ‘anaphylactic shock’, ‘anaphylactoid reaction’, and ‘anaphylactoid shock’. Hypersensitivity events reported using other terms, e.g. ‘type I hypersensitivity’, ‘circulatory collapse’, ‘shock’, ‘cyanosis’, ‘periorbital oedema’, and ‘cardiorespiratory arrest’, were excluded. A more robust and holistic set of standardised medical terms associated with hypersensitivity is available, such as the list of Medical Dictionary for Regulatory Activities (MedDRA) terms used to assess the rate of serious or severe hypersensitivity events in relation to the FDA approval process for FCM in the US . The selection bias of the Ehlken et al. analysis (focusing on four narrow terms) can be demonstrated by examining the outcome of searching the VigiBase™ database  using three broader sets of terms. 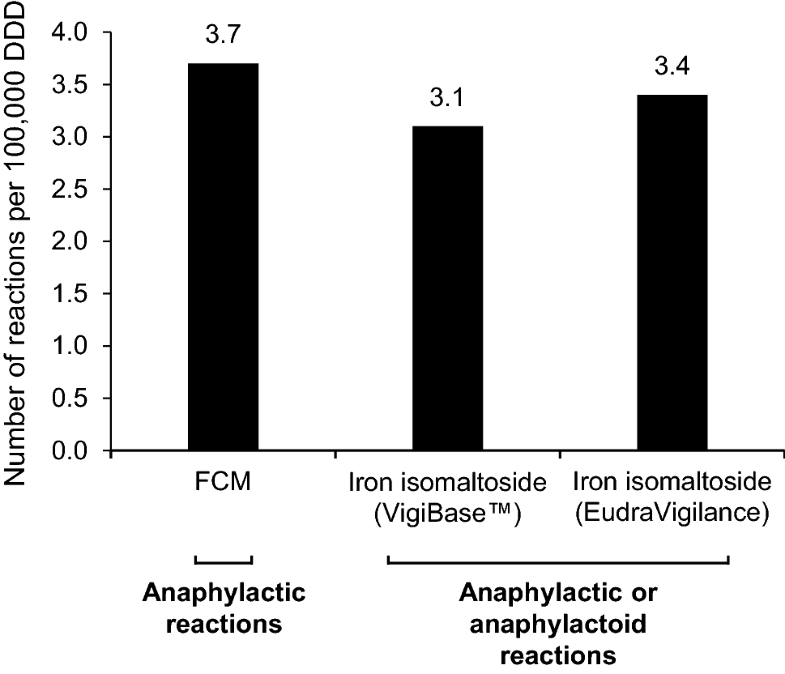 Using the same terms listed in the FDA review of FCM , the hypersensitivity reporting ratio between FCM and iron isomaltoside changes by more than a factor of two in favour of iron isomaltoside compared with the ratio based on the narrow selection of four specific preferred terms by Ehlken et al. Using the term hypersensitivity (including type I–IV hypersensitivity) also changes the ratio by more than a factor of two in favour or iron isomaltoside. Searching for events with a fatal outcome changes the ratio by a factor of five in favour of iron isomaltoside. The authors state that low-dose formulations exist for FCM and iron isomaltoside, and that these formulations are included in the analysis. This is inaccurate and introduces a further source of bias. While both products are available in different vial sizes, only iron isomaltoside has a dedicated low-dose formulation (Diafer®; Pharmacosmos A/S, Denmark). This low-dose formulation of iron isomaltoside is indicated exclusively for dialysis patients  who tend to be elderly with significant comorbidities. Consequently, by including data for these patients, it is likely that fundamental differences in the underlying patient populations exist, and that (per defined daily dose [DDD]) more patients may have been exposed to iron isomaltoside than to FCM, thereby resulting in an overestimation of the reporting frequency for iron isomaltoside. Additionally, a comparison of the IQVIA sales data reported in the Ehlken et al. article, with Pharmacosmos’ own sales data for iron isomaltoside (Pharmacosmos data on file), shows that the authors underestimated the actual use of iron isomaltoside in each reporting year, thus leading to an overestimation of hypersensitivity reporting frequencies for iron isomaltoside. 4 Relevant Data Contradicting the Paper’s Conclusions are Ignored by Ehlken et al. The aforementioned FDA review of FCM reported a frequency of serious or severe hypersensitivity events of 1.5%, based on gold standard, prospective clinical trials , a frequency that is clearly stated in the US prescribing information for FCM . Even after adjusting for the median dose in a treatment course according to the US label, the reporting rate of ‘severe hypersensitivity reactions’ (as defined by Ehlken et al.) of 0.3–0.5 per 100,000 DDDs is several orders of magnitude below the frequency stated in the US label . The same is true when considering the more limited frequency of serious anaphylactic/anaphylactoid reactions of 0.1% stated in the US label . Given that the frequencies for FCM stated by Ehlken et al. are discrepant by several orders of magnitude, the attempt to conclude on differences in frequencies between FCM and iron isomaltoside is misleading and scientifically invalid. The list of terms related to hypersensitivity from the FDA review was also used in a systematic analysis of data from prospective studies in more than 5000 patients comparing the incidence of serious or severe hypersensitivity events between iron isomaltoside, FCM, and iron sucrose . This analysis specifically evaluated whether the reaction was reported as serious and/or severe , which was not considered by Ehlken et al. The analysis showed a significantly lower rate of serious and/or severe hypersensitivity events with iron isomaltoside compared with FCM (0.6% vs. 1.5%; p = 0.01) . Using a narrower set of reporting terms, which included the four preferred terms selected in the Ehlken et al. analysis (plus six others), reduced the incidence rates to 0.06% for iron isomaltoside and 0.11% for FCM . Head-to-head data remain the gold standard for comparing the rates of events between two products as they capture exposure and outcome in a standardised manner, avoiding differences in prescribing patterns and reporting methods, as acknowledged in the Ehlken et al. article. The authors also stated that, “So far, no comparative safety study on severe [hypersensitivity] reactions associated with ferric carboxymaltose and iron isomaltoside has been published”. Two recent head-to-head randomised controlled trials (RCTs) comparing FCM and iron isomaltoside—the PHOSPHARE studies—captured the incidence of serious or severe hypersensitivity events in a standardised manner . Pooled analysis of the PHOSPHARE data showed hypersensitivity rates that are in line with the previously mentioned systematic analysis [8, 9]. The data in the systematic analysis and the PHOSPHARE studies are further supported by recently published data from the FERWON-IDA study , a prospective, comparative head-to-head RCT in 1500 patients evaluating serious or severe hypersensitivity events as the primary endpoint . The data from these three robust studies render the conclusions of the Ehlken et al. analysis invalid. For all of the reasons outlined here, the conclusions of Ehlken et al. are incorrect, scientifically invalid, and misleading. Considering the severe limitations of the study, it is difficult to view this article as anything other than concealed promotion by the manufacturer of FCM (Vifor Pharma), in line with the fact that all authors were Vifor Pharma employees or consultants receiving remuneration from Vifor Pharma. This letter was funded by Pharmacosmos A/S. Philip Schaffalitzky de Muckadell and Claes Christian Strom are employees of Pharmacosmos A/S. European Medicines Agency. Rapid response to BMJ. Re: Pandemrix vaccine: why was the public not told of early warning signs? (EMA/659264/2018). 2018. https://www.ema.europa.eu/documents/other/european-medicines-agency-rapid-response-british-medical-journal-pandemrix_pdf. Accessed 18 Jan 2019. Center for Drug Evaluation and Research. Medical review of ferric carboxymaltose (application number: 203565Orig1s000). 2013. https://www.accessdata.fda.gov/drugsatfda_docs/nda/2013/203565Orig1s000MedR.pdf. Accessed 17 Jan 2019. Uppsala Monitoring Centre. VigiBase. https://www.who-umc.org/vigibase/vigibase/. Accessed 1 Nov 2018. Injectafer® (ferric carboxymaltose injection). Prescribing information. 2013. https://www.accessdata.fda.gov/drugsatfda_docs/label/2013/203565s000lbl.pdf. Accessed 17 Jan 2019. Wolf M. Effects of iron isomaltoside versus ferric carboxymaltose on hormonal control of phosphate homeostasis: the PHOSPHARE-IDA04/05 randomized controlled trials. In: Online abstract to the 101st annual meeting and expo of the Endocrine Society. 23–26 March 2019. New Orleans, LA. https://www.abstractsonline.com/pp8/#!/5752/presentation/16504. Accessed 1 Nov 2018.